You are walking down the stairs in an office building. At each level, there is a sign on the door to tell you where you are. 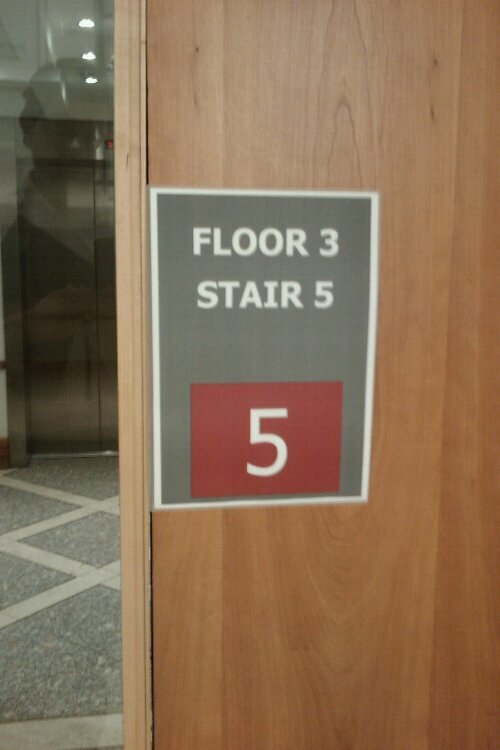 Quick, which floor are you on? The fact that I asked the question probably made you look more closely than you would otherwise have done, so spotting that the right answer is 3, not 5. But all the visual emphasis is on the 5 – from more than a couple of feet away, that’s all that really registers. Knowing which staircase is which clearly matters to some people for some purposes – being able to specify where a light bulb needs fixing, for example. For almost all people for almost all purposes, it does not matter at all. The only piece of information which matters is the floor number – and that matters a lot. It is hard to think of a simpler example than this one of how a user interface could be improved. But the real lesson is perhaps not that it would be better to make the 3 big and the 5 tiny or non-existent on that sign – though undoubtedly it would be – but that there is something about the process which led to the wrong answer having been reached in the first place. My guess about this one (and it is only a guess) is that users were involved in the decisions about the signs, but that they were the wrong users. By unhappy coincidence, the people responsible for putting signs on staircases are precisely the people for whom the non-standard use of the sign matters most, because they are also the people who fix the light bulbs. They have, it appears, treated themselves as typical customers. I have seen the same mistake made at much greater expense and with much more serious consequences in much bigger and more complicated systems than this. When specialised users are in a position to specify a service to meet their needs, that is what they will do, even if they are a small minority of the overall user base. We may be users of the services we design. But we are not the users we should be designing for.